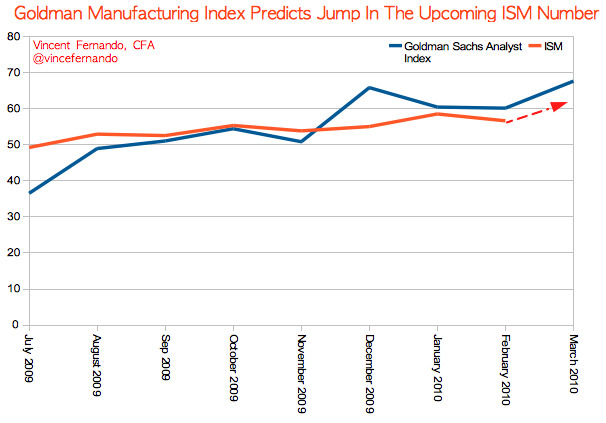 The next release of the Institute for Supply Management’s (ISM) manufacturing index is coming on April 1st. Barring an April Fool’s moment, it’s likely to be good. That’s because Goldman essentially puts together their own index that is very similar to the ISM, and they get it out ahead of the ISM. The key activity indices – sales and orders – both remained high. The sales index improved further this month, continuing a general upward trend that has been evident for the past four months. Although the index of new orders fell, it has consistently been at high levels since August of 2009, suggesting ongoing growth in orders. On a softer note, a large increase in the inventories index narrowed the gap between orders and inventories. 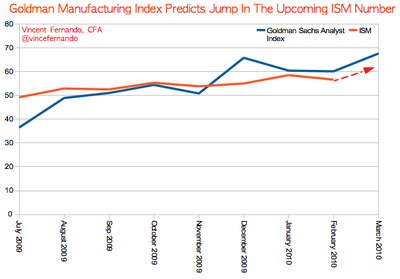 This gap is a useful leading indicator of demand for manufactured goods. Similar to other data on inventories, March’s reading of 44.5 suggests inventory levels are beginning to stabilise. March’s employment reading returned to the levels seen in December/January after a setback in February, which now seems to be the result of bad weather. The index increased significantly by 18.3 points to 46.5. This increase reflects a “less bad” employment outlook, but with a reading below 50 still consistent with a soft labour market.